As I recently wrote about in more general terms: I have released a piece of interactive fiction called Waybinder. The game is available to play for free now, at Itch.io. I’ve not created a game like it before, and so it quickly became a valuable learning exercise in narrative design. I would not, however, be so bold as to claim I could now churn out a definitive ‘how to’ on writing 30-minute interactive fiction. Instead, in this article I can but describe the means by which I happened to develop this ‘interactive novella’, applying what I know from game design to the act of writing fantasy fiction. To that I only added one thematic ‘pillar’: to somehow delve into ‘sense of place’. With all this and a duration goal of ‘short story’ in mind, I started writing a free-form draft over no more than a couple of days. I wrote this draft directly in Twine — an engine which I was already familiar and comfortable with. At this point, Casting Foundations told the story of a magical practitioner on their way to a city of their design, whose journey is interrupted by an emergence of mysterious crystals. The player was afforded a few means of reacting to this incident, and I wrote out one pathway which saw them helping an injured party to safety before having to confront a face from their past. What are the limitations of magic in this world, both for the player and the imbued environment? or: What are the physics of the world, and what could the player reasonably expect to be able to do within it? Why was the city built, and why here? or: What is the backstory for this place, and might that affect the player’s motivations now or in future? Who is the player likely to meet? or: What is likely to motivate or hinder the player, and how many relationships can I expect them to manage? Some of these design queries take on a new kind of importance when working in interactive fiction. For starters, a player’s expectations for agency and relationships within the game will differ greatly from those they might have for more ludic/active games. However, considering the game world and its logic in order to ascertain what the player is likely to encounter is precisely what I do when making other games. I find these to be the most reliable and internally-coherent prompts for any game mechanic, encounter or obstacle. I let the answers to these conceptual questions sink in a bit as I played the prototype back. I should note that at this stage, the prose felt too rough and the scope for interactions felt too narrow to involve any other play-testers. Instead, this was an opportunity for me to test and refine the feel of one ‘slice’ of the game. I kept notes of plot points, environment highlights and encounters which might be most interesting — for this and other potential pathways. What surprised me about this process is that these notes were not especially useful later on. At best, I could refer back to these ramshackle thoughts if I ever felt a case of writer’s block, and wanted to return to my original inspirations. Generally though, this became more of a space for the ideas I didn’t follow. It was an ideal space to store those sentences and paragraphs which I would cut during later revisions — just in case I’d need to refer to them again, or remind myself why they were cut. 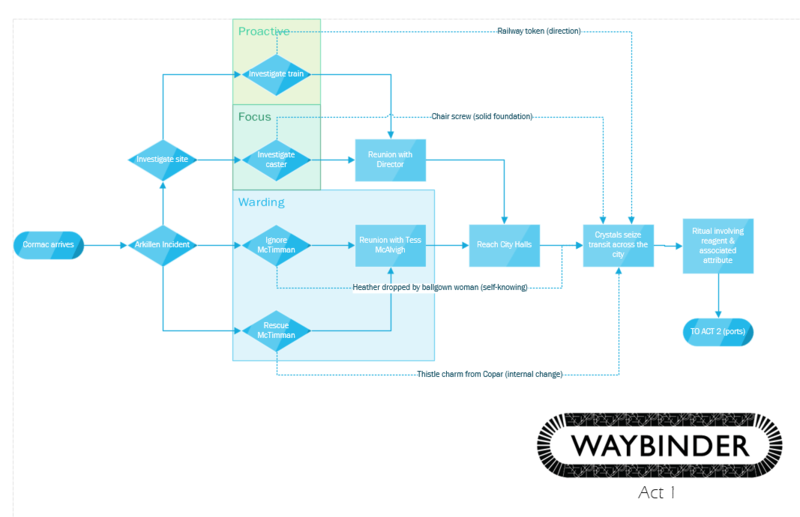 The best design tool which resulted from this process was a basic flowchart, drawn up in Visio. I began by plotting the draft branch I’d written so far, primarily as a means of identifying its key plot points. I kept these broad by referring to them only by their mechanical actions, e.g. ‘establish the scene’, ‘witness the incident’, ‘attempt to flee’. Recreating that one branch allowed me to set up a template, which I could compare to the draft in Twine (also helpfully represented as a flowchart). Now to fill in the other, unwritten branches. As mentioned in my earlier article: I looked to external prompts to help set tones for each of these. I sidestepped the ‘blank canvas effect’ by drawing tarot cards from a deck (in fitting with the game’s ritualistic theme). I refined the attributes embodied within those cards, in order to fit new directions into the game. These would come into play at the first major incident. Rider-Waite-Smith images from Wikipedia, referenced here as artefacts within the public domain. Waybinder‘s key decision-making moment (The Arkillen Incident) now had four clear paths, but also an overall arc. I decided that this one-time, authorial tarot draw would inform the ritual at the game’s climax. With this plot structure, the player encounters characters and obstacles which change how they may interpret events at the end of the game. After a brief period in which I investigated alternative platforms and began work on a map of the city, I returned to Twine and began writing detailed narrative branches. This process was a repeat of the earlier exercise — of turning a synopsis into fully-fledged narrative branches. I alternated between freeform writing, and filling in a more detailed flowchart. The latter took precedent whenever I thought to involve other characters, or have the player perform acts of investigation. It was an invaluable tool for keeping the game’s threads straight in my head. It also informed the variables and ‘visited passage’ calls which form most of Waybinder‘s scripted story logic. The game is broken up into 8 distinct sections, which made it easier to set writing deadlines for myself. In some ways, all that remained was a straightforward task, to fill in the gaps. Each block of story could be treated as its own, separate entity precisely because the player and game characters appear in distinct areas of the city. My attempts to instil a sense of place would also help keep those places reasonably separate from one another. This distinction between narrative branches also helped me write for a subtly different tone each time; this would refer back to the tarot draw. The game’s structure remains relatively simple, partly as I saw no particular need to complicate it given its duration. It also felt wiser to do so during a first-time project. As for the final result: it’s early days yet for gauging audience reception, but I feel as satisfied as I can be in the design. I planned Waybinder‘s encounters and overall pathways in a back-and-forth motion between writing and design, based on what I already know. My efforts seem to have happily resulted in an adventure which is consistent with itself. Whether the player tends to flee from danger, investigate the scene or try other routes to discover why a part of Waybinder‘s world is seeking to destroy itself, all paths lead to a ritual which calls upon the insights and discoveries they’ve made up to that point. I have myself a world in which to build more ‘ludic’ games and levels, and an appetite for further experiments in narrative. Both are sturdy stepping stones on the journey I set myself under the Metrowitch Interactive banner: to explore the intersections of story, play, and ritual.